I'm sure we've featured Bill Brownridge here before. 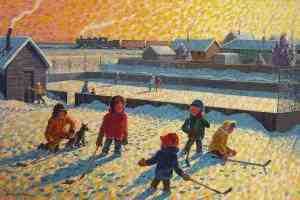 He has an upcoming exhibition at Canada House this Saturday, including this When You Can't Find the Puck. What I did not realize, though, is that this painter of exuberant hockey-loving prairie youth also designed the logo for the Calgary Flames! Way to go, Bill!